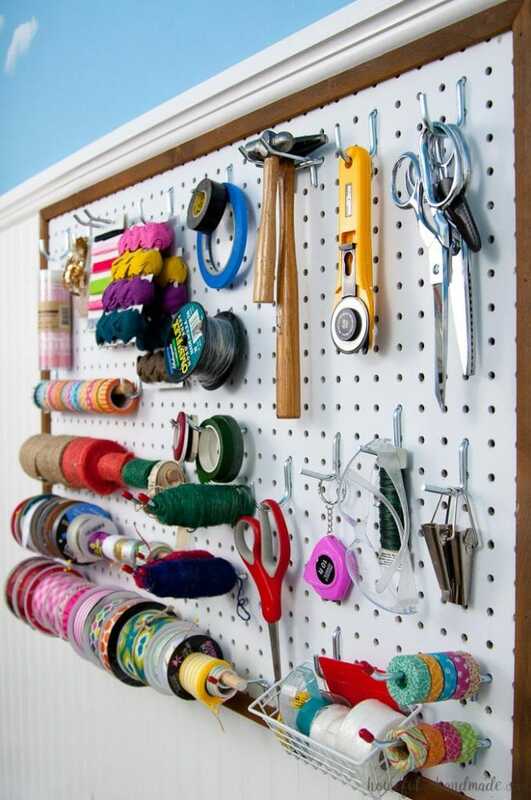 If you haven’t use pegboard to organize your sewing or crafting supplies, you should! Seriously, it was a huge game changer for me when I created my pegboard in my old craft corner. Having my scissors, washi tape, ribbons and other frequently used crafting supplies within arms reach, always ready to go, makes crafting so easy. But when I moved from my craft corner and desk in the living room to my new office & craft room, I knew I wanted my pegboard hung so it wasn’t permanently attached to the wall. With a few extra steps, I figured out how to hang pegboard so it is removable (or easily moveable). If you missed yesterday’s post, I am working on redoing my new office & craft room this month by only spending $100. Yikes! That is a very small budget for everything I have planned. 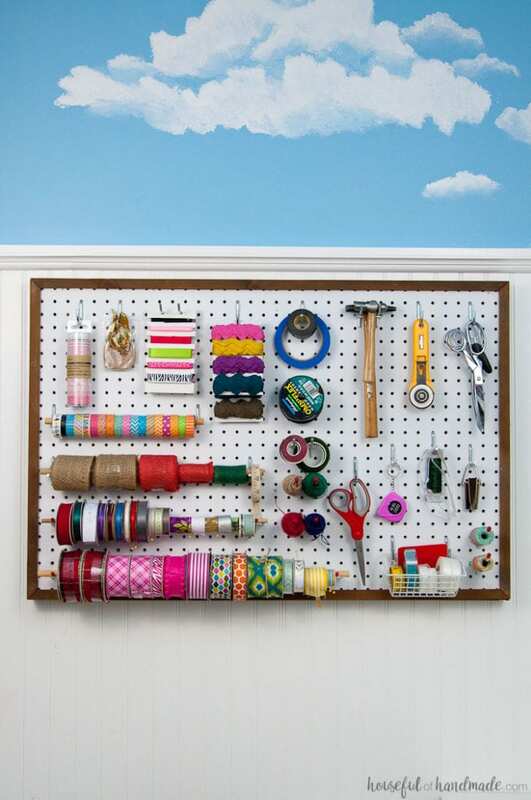 Luckily, I already had this pegboard hanging up in my old craft corner. I just needed a way to bring it into my new space and pretty it up. I am happy to report, I managed to figure out how to hang pegboard so it is removable and only spent $0! 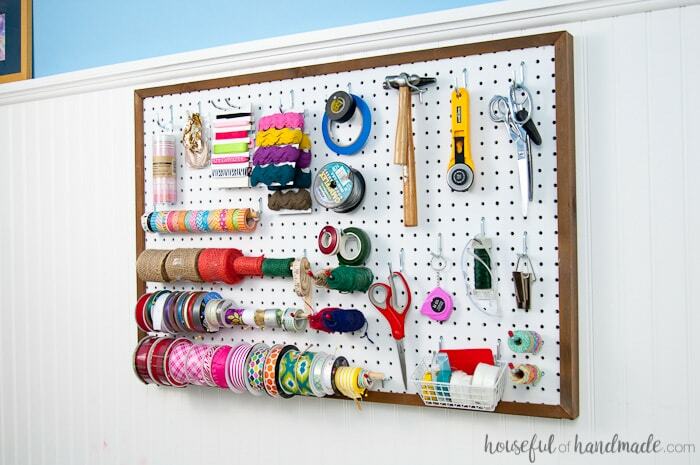 If you do not have an old piece of pegboard and a pile of scrap wood lying around, it may cost you a little bit to make this awesome craft room storage solution. But it is still very cost effective. You can find pegboard hooks in packs for a great price. Also, I built the frame for this pegboard to hang on out of 1x2s and 1x1s which are less than $2 for an 8′ board. To build my 3 foot by 2 foot pegboard, I would have needed to buy 1 1×1 and 2 1x2s (and I would have lots leftover for another project). 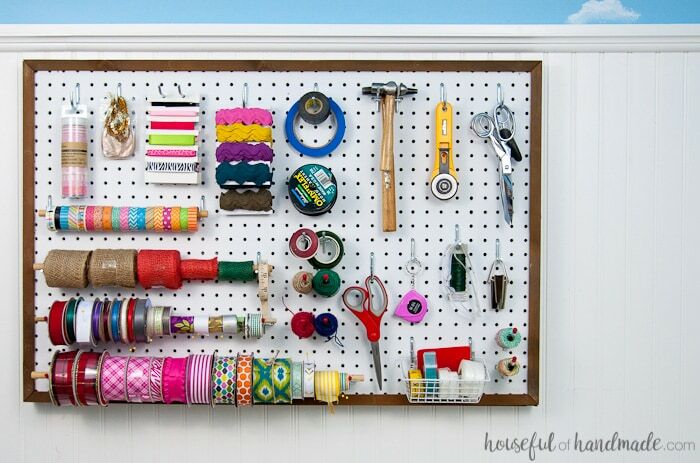 And can we just talk about how pretty the pegboard looks loaded with craft supplies and tools? 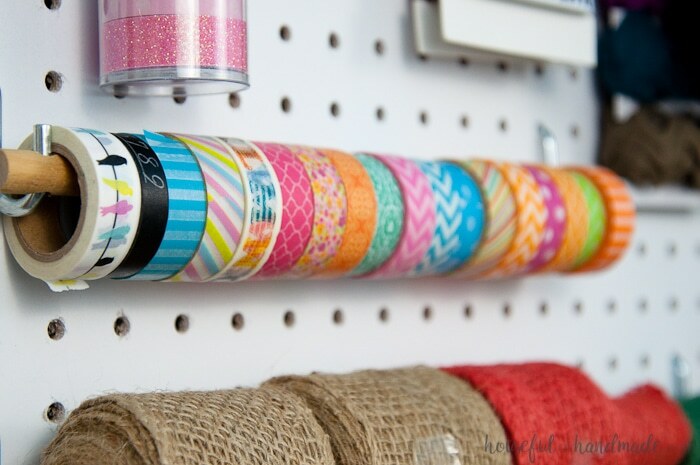 This roll of brightly colored washi tape really makes me happy. Having my special sewing scissors (that NO ONE is allowed to touch but me) always ready to go really makes crafting easier. I also hang up my rotary cutter that I use for everything. Seriously, this is one of my favorite tools for cutting. You can use a ruler and quickly cut clean lines on paper, cut out patterns in way less time than using conventional scissors, and more. And those blades are so sharp so they cut easily (and replace easily after lots of use). So if you are ready to see how to hang pegboard that isn’t permanent, click the arrow below for the whole tutorial. Now that my pegboard is back in business, I’ve got a few more work spaces to build so that I can be super productive in my new office & craft room. Make sure to stop by next week when I share how I’ve turned a couple cheap white bookcases into the perfect mobile work table! There are going to be so many budget friendly ideas for this space, sign up for my weekly newsletter so you don’t miss out on anything!